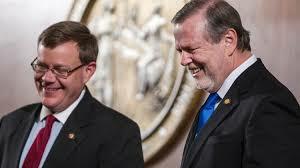 The Republican leadership in the NC General Assembly -- Phil Berger and Tim Moore -- have spent $9.3 million since January 2011 defending laws they passed which have either been ruled unconstitutional already or soon will be. $9.3 million of taxpayer money, spent on defending extremism in action. Berger and Moore yell that they have had to do that because Attorney General Roy Cooper won't do his job, but that's a lie. Cooper expended department time, money, and lawyers defending the monster voter suppression law, for example, and those department lawyers appeared in court side by side with the private attorneys hired by Berger and Moore. In other words, the state -- we the people -- were double-billed for defense of the indefensible. Cooper did make judgments on laws that were in his estimation "no longer legally defensible," like the gay marriage amendment, so he stopped going to court once that horse was out of the barn. Legal assessment of the likelihood of losing is part of what the people of North Carolina expect from their Attorney General. Crazy is what we expect from our General Assembly. Dumb is what we get from our governor.